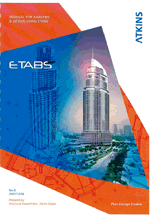 Manual For Analysis & Design Using ETABS by Atkins | - | Structural Department, Atkins Dubai | 2007 | English | 46 p | pdf | 20.41 MB | The primary objective of this document is to make sure that ETABS is used consistently by the structural engineers in Atkins office in Dubai in terms of : modelling and analysis procedures; use of applicable built-in international codes; And complying with local authorities specific requirements;. This document is intended to complement the ETABS manuals and other relevant technical papers published by CSI. It is assumed that the user of this manual has a good command of ETABS and is familiar with the following codes : UBC 97 seismic provisions; ASCE 7 provisions for wind loading; BS codes of practice;. Free download Manual For Analysis & Design Using ETABS. And complying with local authorities specific requirements. Local Authority specific requirements are covered in Appendices at the end of this document. The procedures in this document are based on standard practice in Dubai. However, for specific projects, some parameters or procedures need to be revised. This shall be done in accordance with the design statement and in conjunction with the project lead engineer. trima kasih udah men sharing e-buku nya. bolehkah saya meng copy nya, untuk saya belajar d kampus? @Ronny Hartono: Passwordnya ada di halaman "http://tny.cz/2b19d073"